Network Rail Class 31285 and class 315580 at the Nene Valley Peterborough railway station on Friday the 13th October in 2017. 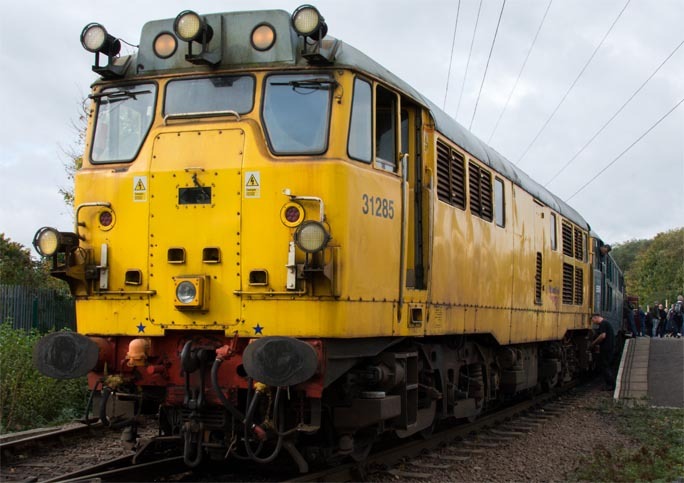 Network rail sent two class 31s to this gala, 31285 being one of them, painted in all over yellow with a grey roof. 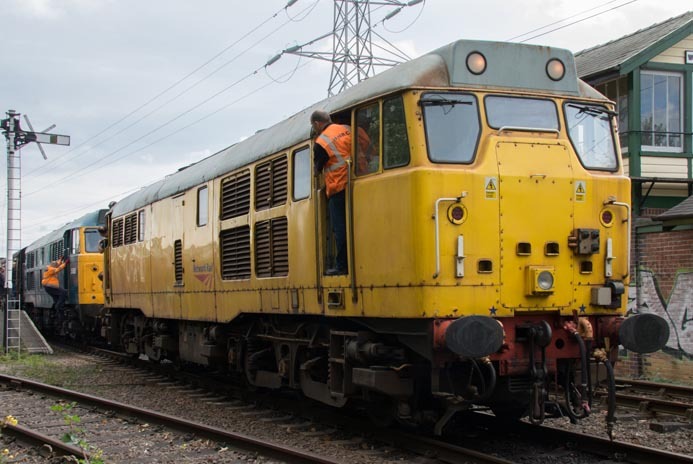 The Nene Valley Railway's Class 31 Gala 2017 was held on Friday 13th and Saturday the 14th and Sunday the 15th of October 2017to mark 60 years of the Brush Type 2 or as it was later called the class 31. Class 31466....Class 31452.....Class 31580.....Class 31459. Class 31108....Class 31271 "Statford 1846-2001"
Network Rail Class 31285 and class 315580 at the Nene Valley Peterborough railway station on Friday the 13th October in 2017. Both 31s have run round there train. Note the lack of spot lights on this end. Network Rail Class 31285 and class 31465 on shed between turns at the Nene Valley Wansford station on Saturday the 14th October 2017. Network Rail Class 31285 and class 31465 wait in Nene Valley Wansford station on Saturday the 14th October 2017. 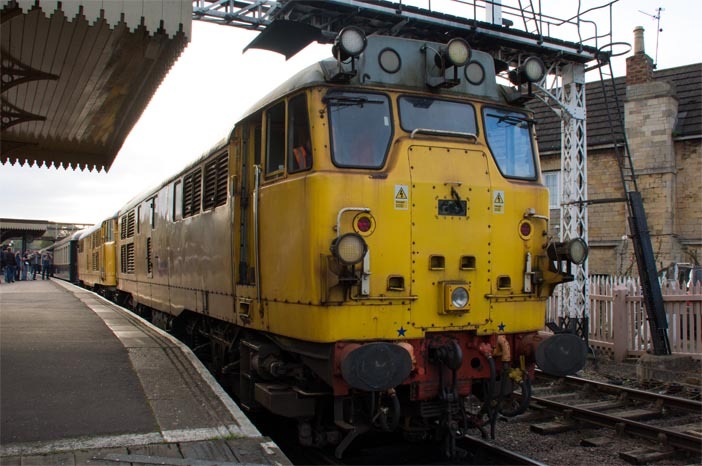 Network Rail has diesel locomotives Class 3131285 and 31465 up for sale in 2017. The Nene Valley Railway runs from Peterborough to Wansford railway station and then on to Yarwell junction. Wansford Station is on part of the old A1 at Stibbingson and is about 2 miles from the village of Wansford itself. The railway line is about 7 1/2 miles long. Trains run at weekends for most of the year. The station at Wansford railway station is open from around 9am to 4.30 on most days. (check on there web site for times) The line runs trains from this country and also from abroad. As well as steam locomotives it also has main line and industrial diesels. It has wagons and coaches and a large collection of railway bits and bobs. At the Peterborough end of the NVR is the Rail World Museum which is next to the Nene Valley Railways Peterborough station. This website is Ukrailways1970tilltoday.me.uk and is on railways but it is not just on trains but all things railways, with photos, which I have taken from the 1970s till now. I take photos of all things railways, steam diesel and electric trains, signal boxes, wagons any thing that is on the National Rail network, which was BR when I started taken photos. Today , Virgin Trains East Coast, Hull trains and Greater Anglia are just some of the names on the trains. The name on the train does not mean, thats whos train it is these days. These names keep changing, but that means I have to keep taking photos. I also take photos of preserved railways with steam diesel and electric trains.There is lots more to add and I keep taking More!